I have to say this years Christmas was great ! For once I didn’t feel pressured by taking on so much this year and I actually enjoyed the season with my family. We did our usual baking gifts for friends and neighbors. The Little’s decorated the sacks for all our goodies. I was really surprised and happy how this years gift exchange turned out. There was so many people thinking outside the box for a change. One of our neighbors is still unemployed and he is a genius when it comes to construction (seriously, him not finding a job scares me a bit). We are in the process of fixing up our home and his generous gift of time is a HUGE blessing to our family. Others have come to respect the path we have chosen and not one gift this year needed batteries. In fact most gifts needed to be constructed. Miss Sky has already made one of her gifts (all by herself) and as you can see its been getting lots of use :). As for ourselves ,besides everything that I had already posted which was a big hit (okay Christmas is over its time to get dressed), we decided to go a different way (no me change plans) and help out local independent businesses. I was SO happy to see how many others had the same idea. A friend informed me of a local toy store ran by two homeschooling mothers that we just had to check out. Even though much of the snow from Christmas has melted and the new year swiftly approaches I hope the magic that was shared this year in blog land will continue as more people find what the reason for the season really means to them. Wishing everyone peace , happiness, and joy for 2011. A Is For Apple, B Is For…..
We will be heading back to “school” and my regular posts the day after Epiphany as Miss Sky and I are preparing for our handwork block. We will be working out of a cool new book and blog I have discovered. Meanwhile I have a funny story to share. I have decided to slowly start “introducing” Little Sis to the alphabet. I know my child is ready. SO while sitting around the table eating breakfast this morning we played a little alphabet game naming things that start with each letter. Well when the time came to move on to B, Papa , Miss Sky and I of course came up with bear, ball, basket, when out of nowhere Little Sis shouts” Band On The Run”. Oh yes the makings of a true music lover. We have been having way too much fun in our household this week. Thought I would share a video from each one of us representing where we are in our journey at this point in time. You mean there are dangerous chemicals. I love the photo of how much we are exposed to daily. Please don’t switch to those new money-saving (CFL) light bulbs they are filled with mercury and need to be recycled not thrown away like the incandescent bulbs. Boy, I feel like a load of bricks has been lifted off my shoulders since my running with scissors post. I am going to be flat-out honest here, unhappiness had found its way into our household. Each one of us has spent time in “grouch land” this year (thankfully never at the same time). Papa and I have stayed up many evenings trying to pinpoint just why. Well to make a long story short, this past month (while in meditation and prayer) the answer came , it was me. I was the cause of our unhappiness, I have been trying to conform us into something we are not. We love books (whether they have ” images” or not ) and music (I couldn’t imagine life without it). Yes my children know the words to almost every Beatles song and Little Sis can even tell you which one is singing lead vocals. They also know Mozart, Glenn Miller, Hank Williams Sr., Johnny Cash, Sam Cooke, Cab Calloway, and Kiss *gasp*because we are weird like that. Papa and I love movies, I have mentioned before Jimmy Stewart is my hero (next to my grandparents) and I plan on watching every movie he has ever made. We also agree that Frank Capra and Alfred Hitchcock were the best directors ever. My husband LIKES sports and watches football (YEAH COLTS) and Nascar most Sundays. And I can’t tell you how excited I am that The Dark Tower series is FINALLY coming to the big screen. We also love spending time outdoors with Mother Nature and try not to give into our materialistic nature. When starting out on our homeschooling journey the goals I had listed for my children were to show compassion toward their fellow-man , that they do have a voice and we all have a gift to bring to this world but the most important, ALWAYS be yourself. This past year I have put way to much focus on what color my child’s room should be,whether or not I have “woken”my child up too early, and which toys my children can or can’t have and somewhere in all that I FORGOT TO LIVE ! I am learning everything in moderation, that too much of one thing is not healthy. So this weekend we did just that. Little Sis is one smart cookie, she can add dice together by just looking at the numbers and can do word searches better than her 10-year-old sister. I can no longer hold her back. What I can do is make sure she doesn’t always stay in her head. To make sure she gets plenty of play time and not to force anything she doesn’t want to do. We had family coloring time (with preformed images) and loved every minute of it. I use to color for hours as a child and find it very relaxing. My sister still loves to color with The Little’s when she comes up to visit. We have been spending time outdoors playing in the snow and enjoying the Christmas cards and letters coming in from our card swap. This is the first year we received one from Spain. The Little’s have been playing “school” (go figure) and writing book reports. It feels SO good to find “happiness” back with us again. Wishing you all the same ! With our Christmas music in full rotation this week and the holiday very swiftly approaching I have been reminded of certain “traditions” that happen around this time of year. We added the animals to our seasonal table and made treats for our animal friends that have stayed behind for the winter. I have been enjoying these “relaxed” days with my girls and they have been setting the pace of our days. Then there was a “promise” from Mama. They have put up with many changes that have taken place this year, some that has not quit gone over well with a certain Little. Well I am not one to go back on a promise. Now to fulfill one more Christmas tradition. These last few weeks I have taken advantage of not having any “enforced” lessons to really evaluate where we are on this journey called life. Are we happy ? Somewhere along the journey I lost who I was. I tried to “conform” myself into something I never wanted. Isn’t it funny when the one thing we try to steer away from is the very thing we end up doing. For those of you who have managed to stick around my musings, I still plan on educating using Steiner’s ideas but feel that in the end I am the best judge of what my children need. I am sure mistakes will be made but that is good right, how else can we learn ? If you are looking for beautiful chalkboard drawings or perfect main lesson book pages you have come to the wrong place. If you don’t mind reading about all my imperfections then by all means grab a cup of tea , coffee , any beverage will do (wine maybe :0) and join me on this roller coaster of a ride we call life. Christmas school has been going great. It’s funny, though the pressure is off Miss Sky has been doing more “school” this week then all year. She is on her 5th chapter book (the most independent reading she has ever done in this time frame). She is enjoying “playing” with tangrams. She has been stepping up in the chore department working really hard to save up money to buy a plush panda. My daughter LOVES animals and has been reading up on pandas. She even gave it a name before we could pick it up. 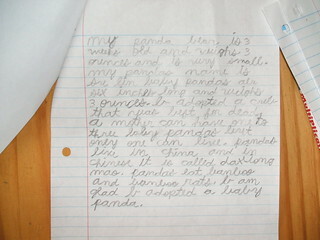 Well on the way home I asked if she would like to write a theme about her panda (no enforced academics while in Christmas school) and she was SO excited to do this. I did not help her at all, I was really surprised at how much she came up with. This is a child that dreads writing. Not to worry though one thing I have not had to think much about is Miss Sky being too much in her head. Little Sis on the other hand,I have a feeling we will be bumping heads. It is amazing how different each child is. One I have to struggle with to do school and the other I have to struggle with to play but she actually has been busy creating this week. There has been lots of creating going on around here and we are in the finishing touches of our projects, I can’t wait to share. I am starting to wonder if I should let go of the “reigns” more often. Alrighty I promise no rants with this post :). Second grade is fables, saints and legends, and a continuation of nature stories. I will say your choice to do saints and legends can be a bit flexible ,it is really about bringing balance to the “trickster” tales and the character you are trying to instill. This probably will be different for everybody depending on your religious beliefs. So if you are Buddhist or Hindu you might pick stories from there . Just keep in mind the time period (like 300 -1200 A.D. and such) people like Gandhi or MLK are to recent. I broke these blocks down by having 1 saints and 1 legends and American tall tales . We studied Mu Lan and Annie Oakley during this time too. I also broke the fables down in to 1 block of Jataka tales , 1 African fables, and 1 Aesop fables. We also did Peter and the Wolf. I have been collecting Arnold Lobel’s books for a while now , he is one of my favorites. So we have all his readers and they are all favorites. You can’t go wrong with any of them but if I had to choose then it would be The Frog and Toad collection and his book Fables is a great read aloud for this year. Okay I am really having a hard time just picking one, Miss Sky says Mouse Soup and Mouse Tales. Little Sis says “no-no- no” Small Pig . I want to point out 95% of our books are used from thrift shops or come from our Half Price book store. With that being said here is a list of our favorite read alouds from second grade. Mrs. Piggle-Wiggle, Hello Mrs. Piggle-Wiggle, Mrs. Piggle-Wiggle’s Magic, and Mrs. Piggle-Wiggle’s Farm. And as for Miss Sky’s favorite author and most read story in our house, Mr Thornton W. Burgess and The Adventures of Reddy Fox. Oh yes Miss Sky has taken a liken to Mr. Sly and sneaky fox and she has been collecting all of the Old Mother West Wind tales. We love them here in our home. I used this program along with Family Math for our math blocks and the resources I listed in the first grade post continue this year. Updated : I forgot to mention School As A Journey by Torin Finser and Teaching As A Lively Art by Marjorie Spock. I love to read the chapter that has to do with the year I am preparing before I start my planning. These start with 1st grade and go all the way to 8th. Great resources. Well that about sums up our second grade year hope this list comes in handy for anyone planning or doing second grade. Wishing everyone a warm week !